Several government initiatives across various countries to educate masses about the rise of various diseases and increasing healthcare sector producing new drugs are the prime reasons for growth of neurological disorder drugs market. European Parkinson’s Disease Association, in Europe is actively supporting research and development by campaigning to raise awareness, and providing medication to patients is boosting the overall neurological disorder drugs market. This region is also witnessing rising focus on research and development programs that will help in producing affordable and effective drugs. The countries are collectively spending on developing neurological disorder drugs thus, improving the revenue of the market during the forecast period. Staggering increase in brain altering disorders such as Alzheimer’s, epilepsy, Parkinson’s, cerebrovascular, and sclerosis are promoting the pharmaceutical firms to tap into the significantly growing neurological disorder drugs market. This will potentially supplement the market growth in the coming years. Rise of several innovative drugs to manage these diseases will swell up the investments in the market. Increasing number of clinical trials are another reason boosting the market. Rise in geriatric population along with patients with strokes, migraines, and headaches leading to cerebrovascular diseases are likely to augment the growth of the market. The treatment for neurological disorders can be expensive due to several additional expenses related to sedatives and hypotonic, antiepileptic and anticholinergic drugs. There has also been decline in development of drugs due to expensive cost of research and development. Maturation of product portfolio can also cause decline in innovation. Strict policies to prescribe sedatives act as the major restrain in the market. However, increasing prevalence of neurological disorders have the potential to create growth opportunities for the Europe neurological disorders drugs market. Rise in awareness regarding the diseases along with government’s support will boost the growth of the Europe neurological disorders drugs market. The Europe neurological disorder drugs market is anticipated to rise at a healthy CAGR of 6.4% during the forecast period of 2015 to 2024. The Europe market was worth US$18.3 bn during 2015 and is expected to attain a valuation of US$32.0 bn by the end of the forecast period. The European neurological disorder drugs market is segmented according to disorder into cerebrovascular diseases, multiple sclerosis, Alzheimer’s diseases, Parkinson’s diseases, and epilepsy. Among these, cerebrovascular diseases are dominating the market with a rising CAGR of 6.9% and is expected to rise by the end of 2024. This segment held the largest shares in the market during 2015. The drug class segment of Europe neurological disorder drugs market are Anticoagulants, Antihypertensive, Analgesics, Hypnotic and Sedative, Antipsychotic, antiepileptic, and anticholinergic. The major distribution channel segment of the neurological disorder drugs in Europe are retail pharmacy, Ecommerce, and hospital pharmacy. 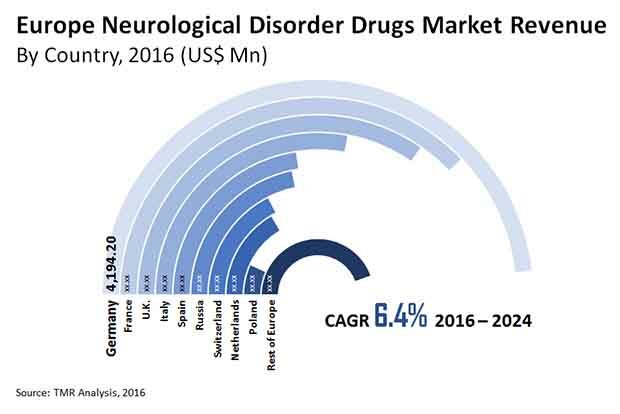 The Europe neurological disorder drugs market is geographically segmented into Poland, Switzerland, Netherlands, Russia, U.K., Spain, Italy, France, Germany, and other parts of Europe. Among these, Germany held significant shares in the market during 2015. Germany is expected to dominate the market during the forecast period. This was followed by France. The market is rising in these regions due to increasing neurological disorder and improved awareness regarding the disease by government initiatives and support groups. Rising number of geriatric population in Germany is one of the leading factor for the rise of neurological disorders drugs in this region. The other leading regions in neurological disorders drugs market are Spain, Switzerland, Italy, and the U.K. Switzerland is also anticipated to provide several opportunities for growth to the overall neurological disorders drugs market. Some of the leading companies operating in the Europe neurological disorders drugs market are GlaxoSmithKline plc., Novartis AG, Teva Pharmaceutical Industries Ltd., Astra Zeneca, Bayer AG, Boehringer Ingelheim GmbH, and Merck & Co. These players are involving in expanding their outreach geographically to reserve their dominance in the market.